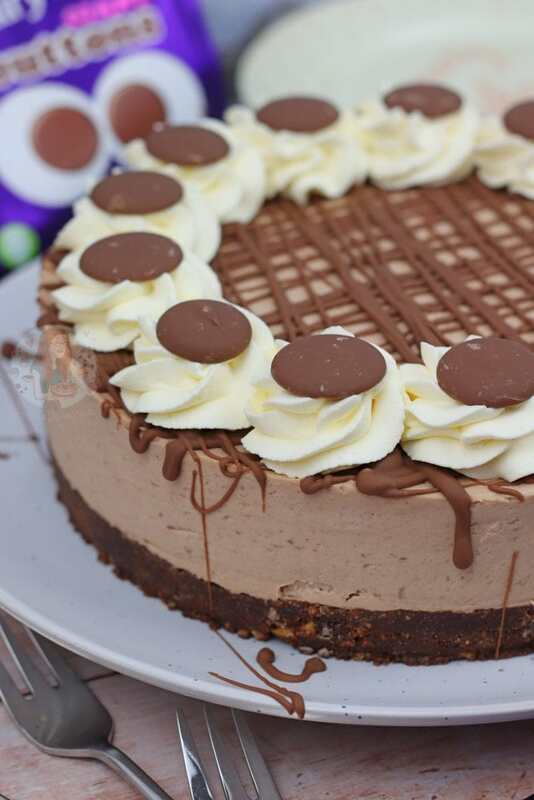 A Delicious No-Bake Cadbury’s Chocolate Cheesecake with a Chocolate Biscuit Base, Cadbury’s Chocolate Cheesecake Filling, and even more Cadbury’s on top! So it’s been a while since I made a cheesecake… that’s a lie. Like straight from the beginning I am lying. I try to make it seem like I don’t do them so often, but I genuinely have a bit of a problem. 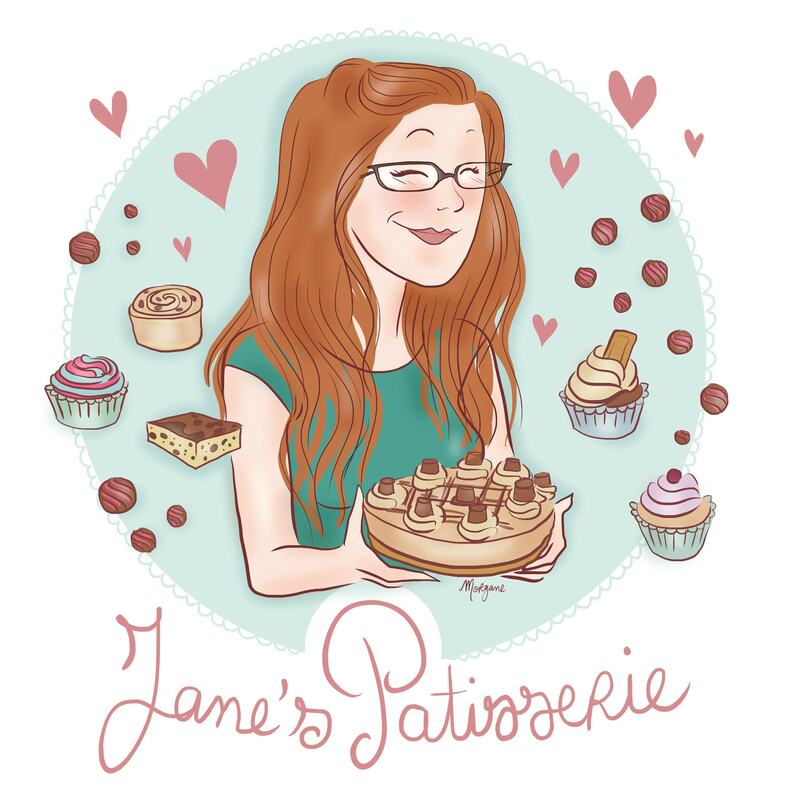 I believe I have roughly 65 cheesecakes on my blog at the moment I am writing this, ranging with all different flavours and types… but will I ever stop posting more?! Only if I run of out ideas. 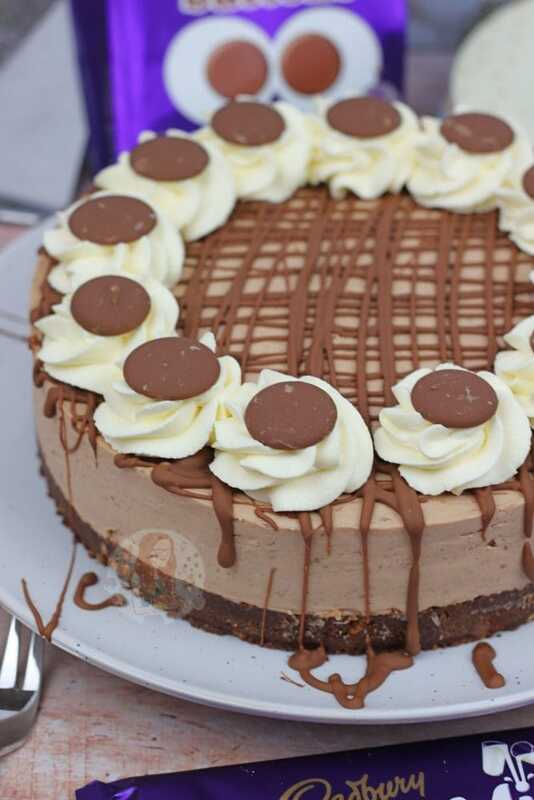 I have done Chocolate Cheesecake’s in the past, and with all different sorts of brands. I have even used Cadbury’s before! 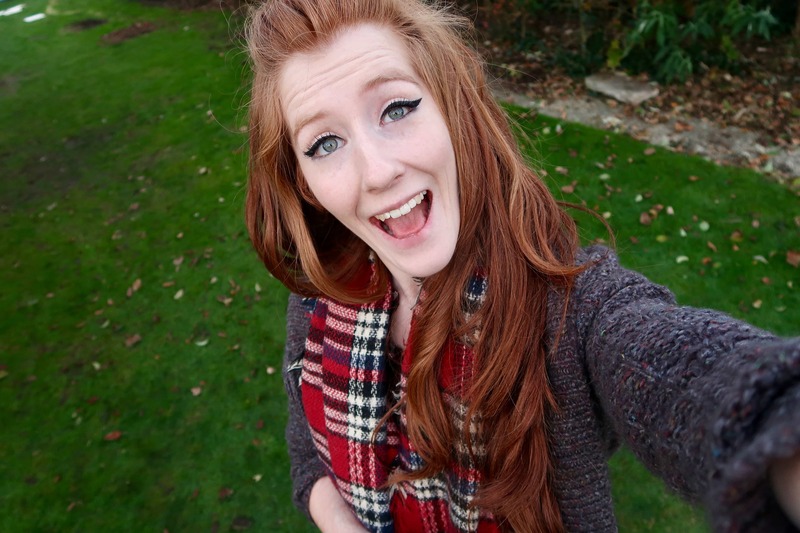 Definitely haven’t done enough to make this post pointless, however. 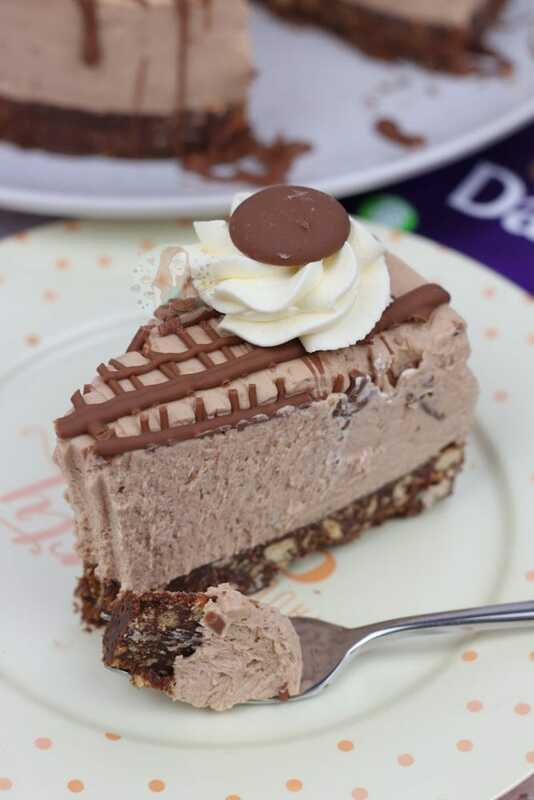 My Cadbury’s Caramel Cheesecake, Double Decker Cheesecake, or even my Crunchie Cheesecake all involve some form of Cadbury’s, but none of them are just the basic Chocolate Cheesecake that so many of you ask for. 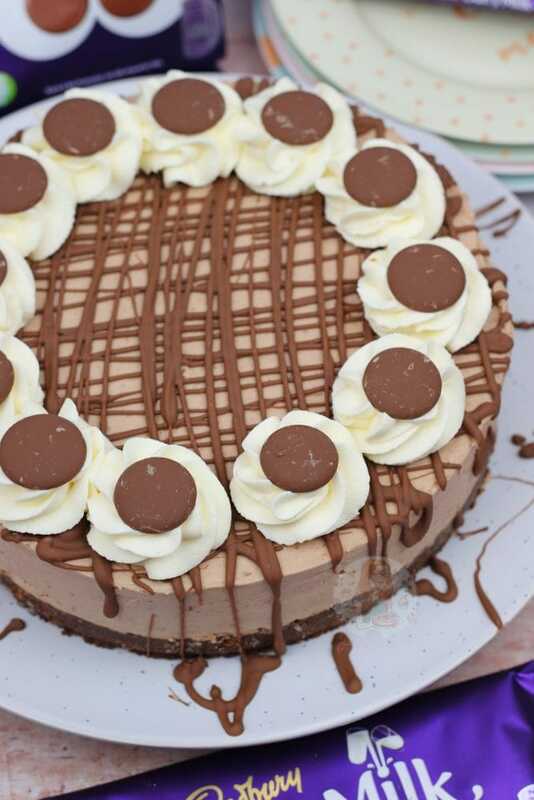 I have technically done a Chocolate Cheesecake in the past, with my Triple Chocolate Cheesecake, but even that isn’t just the basic. 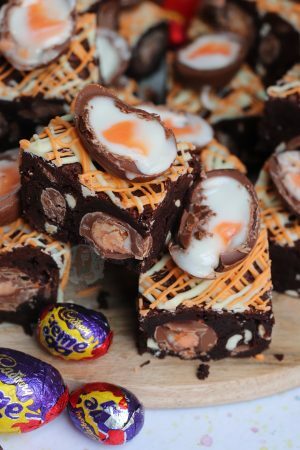 I know I do tend to go quite over the top with a lot of my recipes, but they’re designed to be for special occasions, or showstoppers… they’re not your every day bakes. 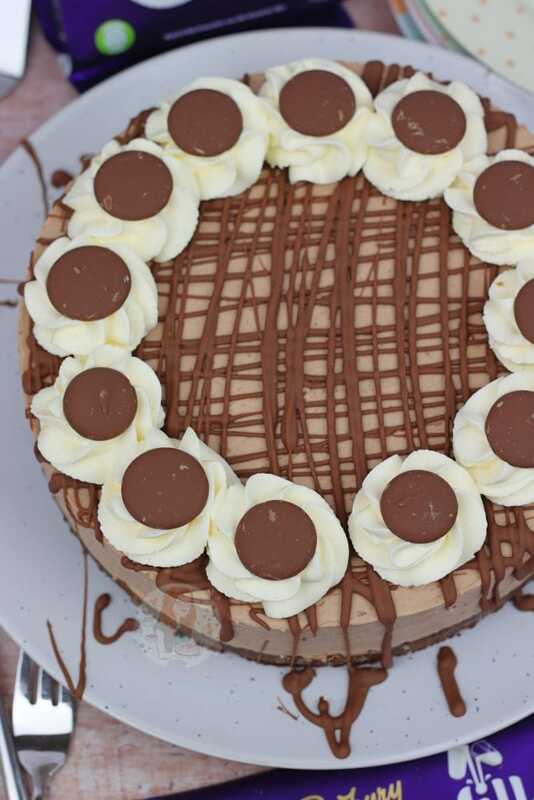 However, because I have had oodles and oodles of requests for a basic Milk Chocolate Cheesecake, I thought I would oblige. The recipe is basically just a basic cheesecake, but swapping out any of my other flavour creations for good ol’ Cadbury’s Dairy Milk. Dairy Milk Chocolate is SO well known, and I remember being so incredibly excited when I was on a school trip to Costa Rica years ago, and we found Dairy Milk in a local shop… it was heaven when we were abroad in quite a different environment. It’s a classic chocolate flavour that can’t be beaten! Unless of course, you swing Galaxy way… I happily adore both. I would say that Cadbury’s chocolate does behave differently to other bog standard milk chocolates because it has different ingredients. I personally believe it melts differently, and I wouldn’t use it for a ganache for example? 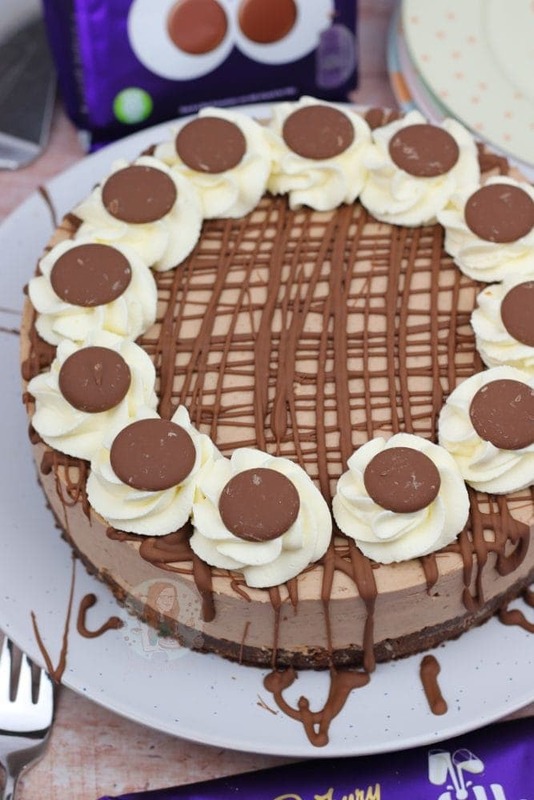 But in a dessert such as this delicious chocolate cheesecake, I don’t really think it matters as much. 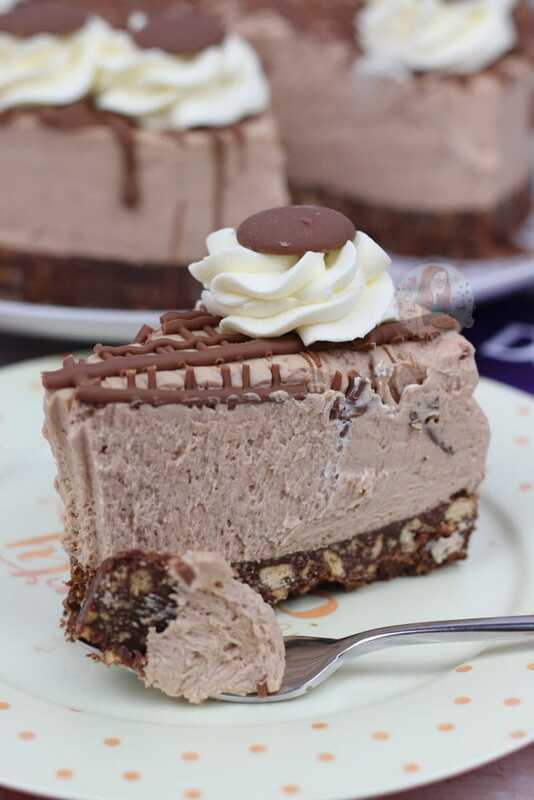 You can’t call a Cadbury’s cheesecake a Cadbury’s cheesecake if you don’t use the chocolate… the taste would give it away immediately. Cadbury’s have recently brought out a Dark version of their Dairy Milk called Dark Milky, and I utterly adore it. It’s again a different flavour to regular Dark Chocolate, but so yummy. 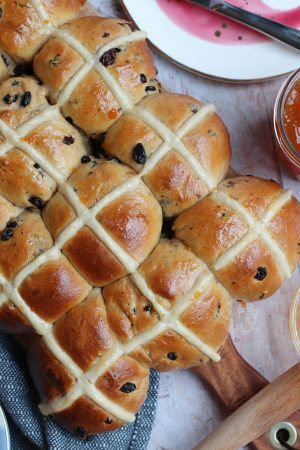 Either would work well in this recipe, or you could even go half and half. As long as it’s Cadbury’s I don’t mind. I decided to decorate this bad boy in a similar way to basically A L L of my other cheesecakes, with a drizzle of chocolate, some sweetened whipped cream swirls, and whatever the chocolate theme is on top. 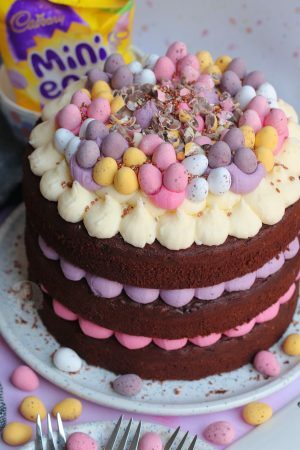 Making my life simpler, I used the Cadbury’s Giant buttons on top, which are so incredibly addictive I’m surprised I managed to keep 12 spare to decorate… but you can use pieces of cadbury’s if you prefer. Yes, these bits of chocolate do end up being a little hard after staying in the fridge.. but I kinda love fridge cold chocolate. A Delicious No-Bake Cadbury's Chocolate Cheesecake with a Chocolate Biscuit Base, Cadbury's Chocolate Cheesecake Filling, and even more Cadbury's on top! Add your Biscuits to a Food Processor and blitz into a fine crumb. Alternatively, use a large bowl with the end of a rolling pin. Add in your Cocoa Powder, and mix briefly. Add in your Melted Butter, and mix until its combined, and press into the bottom of an 8"/20cm Deep Springform Tin. Store in the fridge whilst you make the filling. Melt your Cadbury's Dairy Milk carefully until smooth. I personally use the microwave on short bursts, but you can use a Bain Marie as well. Add your Full-Fat Cream Cheese, Icing Sugar and Vanilla to a large bowl, and whisk until smooth. Add in the Melted Chocolate and whisk until smooth. Add in the Double Cream, and whisk again till thick and combined well. Try not to over whisk the mixture, keep an eye on it and stop the whisk frequently to check. Once all whisked, spread over the biscuit base and leave to set for 5-6 hours, or preferably overnight. Whisk together the Double Cream and Icing Sugar until its pipeable. 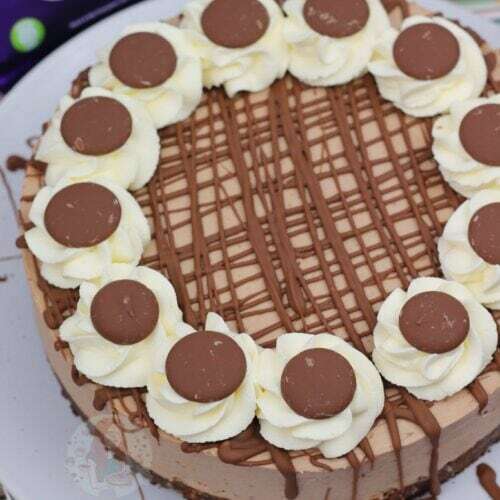 Drizzle over the melted Cadbury's Dairy Milk chocolate, and then pipe your cream on. 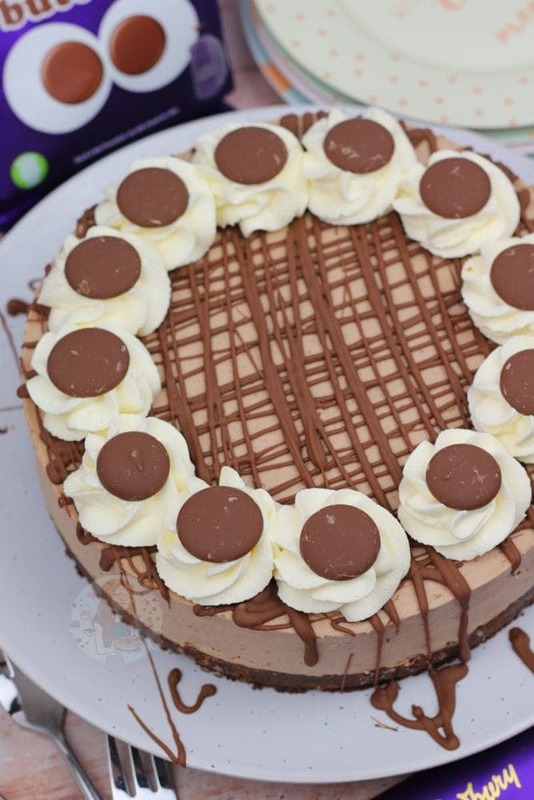 Add on a Cadbury's Dairy Milk Button to each cream swirl and enjoy! You can freeze the cheesecake for up to three months - set fully in the fridge first, however. If your cheesecake mix was thick, and then went thin you have over whisked it. You can swap the Cadbury's Dairy Milk for any other chocolate, but obviously this is designed for Cadbury's Dairy Milk. I recommend this tin for the cheesecake! Older Next post: Giant Galaxy Chocolate Chip Cookies! Newer Previous post: Toffee Apples! making this for Christmas Day. Looks amazing.